December 24, 2015: Stripers were missing in action. Blues turned out to be the new bass. Less intrepid surfcasters would have been down in their cups this 2015 season. To be sure, I was. But NOT Charlie R.
“Verizon Charlie”, as we know him on the beach, simply set his sights elsewhere: on False Albacore—those sleek and swift swimming little tunny known to anglers as “Albies”. They don’t make good eating, and they don’t weigh a whole lot. But Albies kick up quite a commotion when they’re around and they run and fight like nothing else if you’re skilled enough to hook one. Verizon Charlie chased them in Montauk, Southampton, and the Long Island Sound waters near his Port Jefferson home. 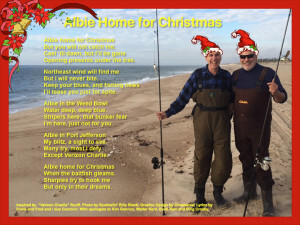 In his honor, Big Brother Frank and I present this year’s Fishmas Card: “Albie Home For Christmas”. Jingle, Jingle, y’all! But you will not catch me. Opening presents under the tree. But I will never bite. I’ll tease you just for spite. I’m here, just not for you. My blitz, a sight to see. But only in their dreams. This entry was posted on Thursday, December 24th, 2015 at 7:06 am and is filed under Uncategorized. You can follow any responses to this entry through the RSS 2.0 feed. You can leave a response, or trackback from your own site.